Text © Copyright November 2010, Oast House Archive; licensed for re-use under a Creative Commons Licence. The Hastings Line links Hastings with Tunbridge Wells and Tonbridge, then onto London Charing Cross. The line was built by the South Eastern Railway (SER) and opened fully in 1853, having been constructed in phases. Tonbridge to Tunbridge Wells opened in 1846. Tunbridge Wells to Robertsbridge opened in 1851. Robertsbridge to Battle 1852 and Battle to St Leonards (Bo Peep Junction) 1853. The line was built very quickly (and not very well) and several of the tunnels need constant maintenance even today, several of them are single track. Tonbridge Station was first built in 1842 by South Eastern Railways with the line coming in from London Bridge via Redhill. Later connections to London via Sevenoaks, Hastings, via Tunbridge Wells and Dover, via Ashford were added making it an important junction. The present station was rebuilt in 1935 with the brick frontage added in 1958. High Brooms railway station is on the Hastings Line ( Link ). It serves the northern suburbs of Tunbridge Wells and Southborough. It was opened in 1893 as Southborough Station by the South Eastern Railway, changing to its present name in 1925. Tunbridge Wells Station was opened by the South Eastern Railway (SER) on 25th November 1846. It is on "the Hastings line" ( Link ). The station is a cut station with access in both directions by tunnels, the Grove Tunnel from the south and the Wells Tunnel from the north. The station has a regular service to both London Charing Cross and Hastings as well as shuttles to Tonbridge and some to London Bridge via Redhill. A small station on the Hastings line. The station was opened in 1851. The Station buildings are Grade II listed. The station is in Bells Yew Green approx. 1 mile from Frant. Wadhurst station was opened by the South Eastern Railway (SER) in 1851. It is on the Hastings line. The station is about one mile from the village at the foot of a steep hill. It is an important commuter station for the surrounding rural area. The station was opened in 1851 by South Eastern Railway. It was called Witherenden, it was renamed Stonegate in 1946. The station is on the Hastings line. Battle Station is on the Hastings line and was opened in 1852. The station buildings are Grade II listed Link . The station has offset platforms linked by a footbridge. Crowhurst station is on the Hastings line. The line was opened in 1852, but the station was not built until 1902, when a branch line to Bexhill was built just south of the station. The branch line and most of the station buildings have been dismantled. The station has an hourly service to Hastings and London Charing Cross. West St Leonard's Station is on the Hastings Line. It is served by Southeastern trains with an hourly service in both directions. It is located just north of Bo-Peep Junction, where the Hastings line joins the Coastway line. The station building and house of St Leonard's Warrior Square station were constructed in 1851. The station was built and owned by the South Eastern Railway (SER). The station is located on the East Coastway and Hastings lines. The station is a cut station between two tunnels, The Bo-peep tunnel and Hastings tunnel. The railway first came to Hastings in 1851. 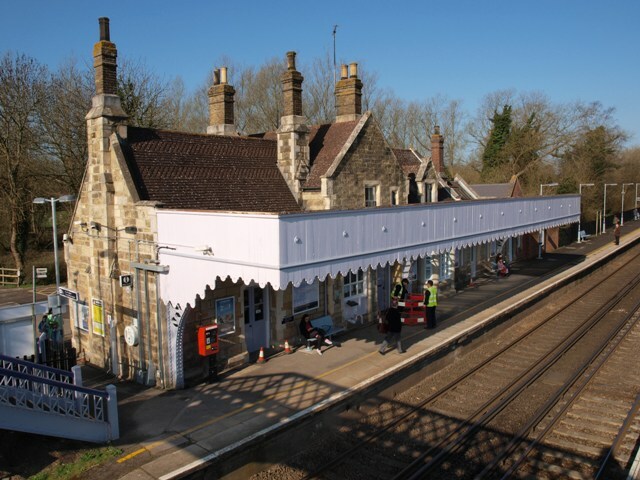 A V-shape station building was originally built allow two competing railway companies to operate with 2 platforms each. This building was replaced with a neo-Georgian style building in 1931, which was subsequently replaced in 2004 with a glass station building. Hastings is about 1h 45min journey to central London via the Hastings Line.